SafetyPass Pro XM7DTM Deutsch DTM Connectors Found on Some 2012 - 2014 Freightliner, Volvo, Scania Trucks with Automatic Transmissions. Possibly Other Models. 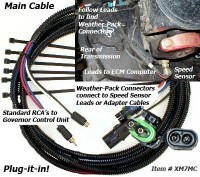 For use with Main Cable (XM7MC). 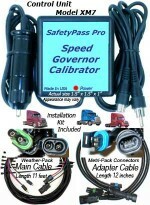 Plugs into vehicle speed sensor leads. 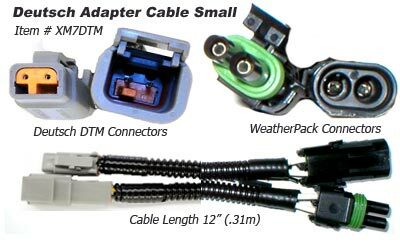 Adapter Cable Length: 12 inches, 0.3 meters. 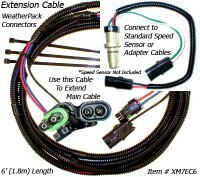 We have found that it is a good idea to visually inspect your speed sensor connectors that are located at the rear of the transmission on the output shaft because truck manufacturer's have been known to use alternate connectors that are not listed in the shop manuals in order to meet production quotas. Also, field repairs can change your connector type. Always check your speed sensor connectors BEFORE ordering. Speed Sensors are always located at the extreme rear of the transmission, on the output shaft of the transmission, just in front of the driveshaft U-joint. Any other location is not correct. 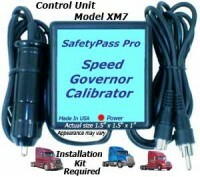 If speed sensor can not be found in this specific location the device will not be compatible with your system. Click the button below to add the Deutsch Adapter XM7DTM to your wish list.